Data is everything for all types of users whether using computers or mobile devices. Regularly we use many computer software to do some specific job and store it in hard disk, like wise mobile users have contacts, SMS’s, Apps stored in their mobile memory card. Definitely these are very important to us and we don’t want to loss anyway. Backup of data means making an extra copy of your important data and stored in different location so that we can restore later in case we face any data loss. Tally is widely used computerised accounting solutions programme used all over the world and no need to say that how accounts is important for a business or company or even for an individual. Today we are going to describe how to backup tally company and restore tally company. In Tally, there are two simple ways to easily backup restore tally company. You can either use the tally Backup and Restore menu option or backup tally company by copying the tally data folder. Follow the below step by step guide to backup and restore tally company. You can also view the Backup Restore Tally Company Video Guide at the end of this tutorial. Go through the tutorial as described. Important Note: The tutorial is based on the Tally.ERP9 but should work with other version of Tally. 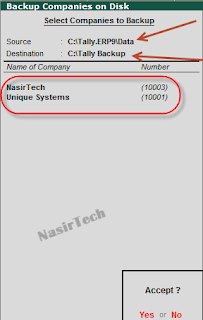 Before proceeding to the guide we recommend you to install tally and make at least two sample companies and do as stated here. For the first process, we don’t need to open the Tally software. You should know that whenever a new company is created, tally creates a separate folder for the company and store all data related to that company in it. 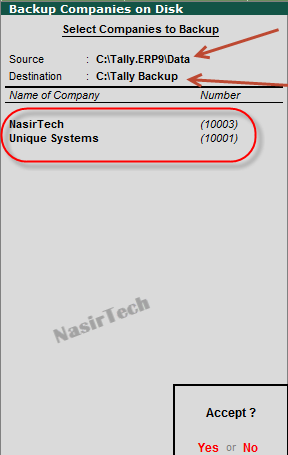 In Tally.ERP9 the data folder is named as 10000, 10001, 10002 and so on. The data folder is normally located in the main tally folder in one of your computer hard disk drive. 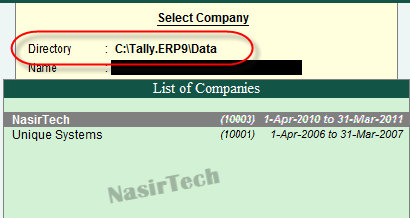 To locate the data folder location of tally in your computer, open Tally, go to Company Info Menu-Select Company and see the directory path of your data folder at the top. See the image below. So, you can go to the data folder location and copy all the company folder and stored it in another location. You can also carry these company folders and paste it to data folder of another computer where tally installed. However, in new computer there may have the same folder, so you can rename each folder to different serial number between 10000 to 99999. Don’t try any other serial number or name while rename. 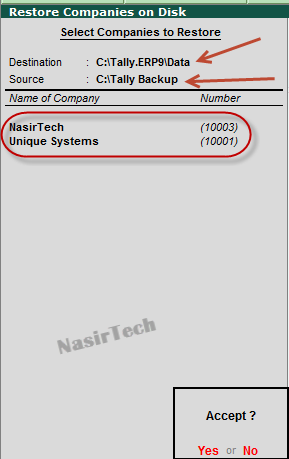 For the second process, open Tally, go to the Company Info Menu-Select Company and check how many companies are there. 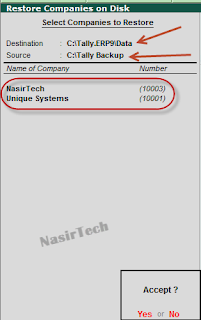 Here we have two companies- “NasirTech” and “Unique Systems” and the location of data folder is C:\Tally.ERP9\Data, as you can see in the above image. You can backup a single company or backup multiple company at a time. To backup both the companies, go to Company Info Menu-Backup. In Backup screen Source= Location of the Data folder and Destination= Location of the Backup Folder (Type C:\Tally Backup in Destination field). Select both the companies and Yes the confirmation message. Tally will create a folder named Tally Backup in C:\ Drive and store the backup file in it. Now, Quit Tally and go to C:\Tally Backup and check the backup file. You’ll find a TBK900.001 file, this file contains both the company folder. You can take it with you in CD or Pen Drive or Email and restore in Tally to get both the companies. Now, open Tally and delete both the companies. Go to Company Info Menu-Restore and type Source and Destination path as seen in the image. You can restore both the companies or select a single company to restore. Warning: Whenever you take a backup, Tally creates the backup file as TBK900.001. So, don’t take backup of different companies in the same location, else the backup file will replace without any prompt. We have also arranged a video guide based on the above tutorial. Check out the video and you’ll get a clear idea on how to do backup and restore tally company. That’s all, you have just learn how to backup restore tally company. Hope you like the tutorial and the video guide. For any queries feel free to contact with us using the comment for below and also let us know how you find the tutorial and share your tally experience here. That really helped... thank you... Mohammad Nasir... That was so kind of you! assalam alaikum, nasir bro i re installed tally in my computer now how can i restore the old data ? plz reply soon. Wishes sir. Extention of the above is the following ok sir? I have changed the financial year in company. When I opened it again, I could not get the data for previous period. It shows " No vouchers enetered" even if we check for previous period. Please let us know the resolution to get previous data.